The weather had been wild for a couple of days, but on the Saturday afternoon I took my usual walk with my son Robert in his pram to visit my mother on St. Peter's Road. As I tried to cross over by the Church, a sudden blast got under the pram's hood and if it hadn't been for a man who helped me to hold it down, I might have been like Mary Poppins and taken off completely. I paid a quick call at my mother's and got home as soon as I could. My husband Jack and I settled down for a quiet evening by the fire. Robert was safely tucked up asleep and we were listening to the wireless, the usual Saturday night programme of Music Hall and a play. About 9.15 p.m. my neighbour banged on the dividing wall, our signal if we needed each other. We went to the door to see what was wrong, to find the river flowing uphill along the road. Most of the neighbours were on their steps fascinated and thunderstruck, not certain as to what we should do next. Tom Harman (who used to sound off the hooter at R.H. Porters) came along and suggested we move ourselves and shift what furniture we could upstairs. 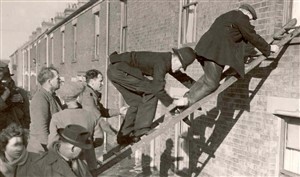 After about ten minutes, the water was lapping round our ankles, so Jack decided we must get to his mother's on Mill Road as his sister Dolly was very ill in a bed downstairs. I fetched Robert and strapped him in his pram, grabbed a few things and we started down the back yard. Once we opened the back gate the water rushed in up to our waists, so we couldn't put the pram down again. We struggled up the passage to Breydon Road, the force of the water pushing us along. When we got near the school playground, it was a torrent. We each held one hand on the railings and one on the pram until we managed to turn the corner into Isaacs Road, which sloped upward, and with the wind behind us we soon reached higher ground. We got to Mum's and our main concern was to get Dolly upstairs. Jack had carried her half way up when all the lights went out and everyone was in complete darkness. We managed to have a quick rub down and change our clothes. There was no man living in the house then, and Jack looked very fetching in his mother's voluminous nightie! We huddled together in bed, none of us able to sleep. We could hear the people in boats shouting to see if anyone needed help. Thankful to see the daylight, we surveyed the scene - quite unbelievable - the water had gone down again there. Mother's kitchen was crowded with people listening to her "Radio Relay". We were amazed to hear the news and the extent of the flooding; never dreaming it could be so widespread and devastating. I sneaked out the back way and went home to try and get Jack some trousers. In our house the water had gone down to ankle deep, so I managed to get him some dry clothes, and rescue my cat. I could feel the water rising again, and was frightened I might be cut off, so I got back again with the cat on my neck like a fur collar. Jack was furious with me, as he didn't know where I was. I dashed over to my mother's to get paraffin for a lamp, and candles. 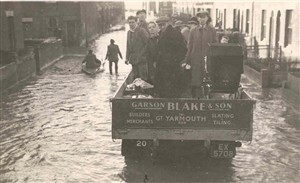 My brother, his wife, two children and canary were there, having been washed out on Boreham Road. Going back over the bridge, the water was already over the top. We were told later that everyone had to leave Cobholm Island. An ambulance crew came for Dolly; they put her on a stretcher over the boat and walked beside her. They had a flat-bottomed boat from the Waterways. Mum was lucky and had a ride in the boat. They went to her sister's in Newtown. People who had no relatives to take them in went to the Holiday Camp at Caister. We followed on one of Jewson's wood carriers (with long legs). The cab was high up and we must have looked funny - Jack, Robert and I, plus our cat and Mum's dog. We were dropped off at the Two Bears and managed to get to my mother's. We only had what we stood up in - no money, no rations. Everyone wanted to help and we borrowed clothes and things. I remember having to wear my mother's knickers - "Directoire" they were called, real passion killers! I had to keep hitching up the legs and they showed below my skirt. By Monday, order was coming out of the chaos. We heard that we were to go to the "Angel" Hotel to get emergency ration cards and some money so see us through. There was great delight in meeting all our neighbours and friends and to hear they were all right. We were given points, depending on the depth of water and how many of us were living in each house. We could spend these at the Drill Hall on clothes and furniture that so many people had donated. Relief workers appeared from various places and after the houses were pumped out by the Fire Brigade we were able to make a start on clearing up. The water was up to the light switch in ours and it was a week before it was gone as we were in a low-lying area, quite near the river. We found we had three inches of mud and the fireguard was festooned with seaweed. We had left our doors open, as we couldn't close them against the force of the water. Our dustbin and contents were deposited on our settee. We had to put our now useless furniture on the front road and it was carted away. We set to, to scrub and clean and disinfect everywhere as much as we could. The Salvation Army were soon in evidence. They took over the School Hall and provided hot dinners, coming round the houses morning and afternoon with tea and sandwiches and helping in any way they could - scrubbing and cleaning for the people unable to do it themselves. We moved back after a fortnight, living upstairs. I was fortunate having a gas cooker and boiler, so my neighbours and I made a rota so we could all cook our main meals and have water for washing, there being no electricity. Electricity men came from all over the country as the road had to have new cables and then the houses were reconnected. Late one afternoon our worker, who had come from Coventry, said, "I can get your juice through tonight, but it's not through the meter!" We had a fine time that night - half the road was doing their accumulated ironing in turn. Lots of tea was drunk that night, sharing our tea rations and gossiping, delighted that we were doing the ironing for free. We will never forget that time. We have only to hear of people being flooded and it all comes back. It was a dreadful experience, but we think of how good and kind people were, helping each other and sharing what they had, the generosity of strangers: the miners who dug coal for us for no pay, the railway that brought it for free and the coalmen who delivered us all ¼ ton free on Sunday for no pay, the people who sent clothes and furniture, the W.V.S. who helped to distribute it, and the "Sally" who gave untiringly of themselves. Even today if there is a high tide and the wind is in that quarter, Jack and others all meet at the river somewhere to check all is safe. This page was added by Laura Matthews on 17/04/2007. If, regrettably, a similar disaster struck today, would the survivors face the aftermath with such a degree of assistance from neighbours and organisations like the Salvation Army? My Dad a Dunkirk survivor always used to say "only the Sally Army were there to help us with tea, sandwiches and shaving gear!" Any criticism of the miners stance during the 1985 strike has to be mitigated by the fact they dug coal without pay to help the less fortunate during the 1953 floods. Thankfully there has always been a volunteer spirit in this country and mutural assistance.